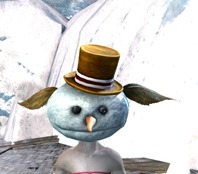 GW2 Gemstore updated today with the Umbral Demon Skimmer and Freezie Crown for 1600 and 350 gems respectively. Pass, no one really uses the skimmer. It is actually 2k gems but it’s currently 20% off so nope. The ball is already rolling with this whole one skin for 2k gems of every mount thing so there’s going to be one for springer and griffon too. Maybe after that then we can see if they learned anything. Oh, that’s a disappointment. I was hoping they’d learned their lesson and were experimenting with different price points to see what would be a more acceptable level for the masses. You’re probably right though. They’ll likely have 1 skin for each of the 5 mounts for 2k gems, and then market them as “exclusive” skins while the subsequent sets cost cheaper. I’d argue that the 20% off is just a marketing manipulation tool. “Hey look, it’s 1600 gems on sale – but you need to buy it NOW!”. When in reality they didn’t sell as much as they would have liked at the flat 2K, and are now testing the waters to see what the market will accept. I guess we’ll know for sure when the pricing comes out on the next skin. 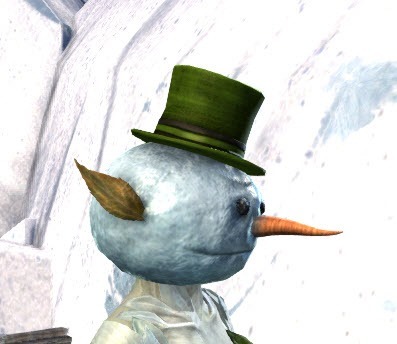 I got one of these for my necro as the look fits him quite well. To be clear I ONLY got it because of the discount. So far I have refused to pay 2k for 1 skin or engage with the random mount skins. I agree that the price should be 1k. If they cut the cost in half they would prob make 3 or 4 times the sales and keep their customer base happy. They will prob release the rest of the series like this. I hope that in the future they will come up with a different system. 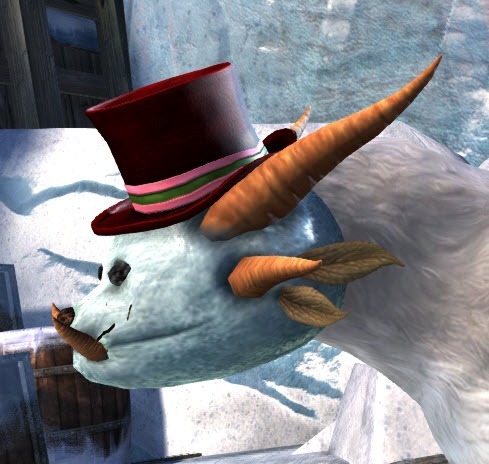 After the Halloween mounts and the concept art for Golem Mounts were released I thought they would be releasing themed sets. This is what I want. 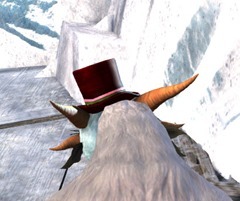 Initially I wanted to give all my chars custom mounts to suit their style and personality. That idea has been put on hold. I still wanna do it but anet really needs to rethink this. I’m just not willing to invest in the current system. True. I feel that the devs can go in one of two directions with mounts however. 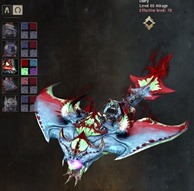 Either they produce more mounts later on or give the existing mounts additional abilities. 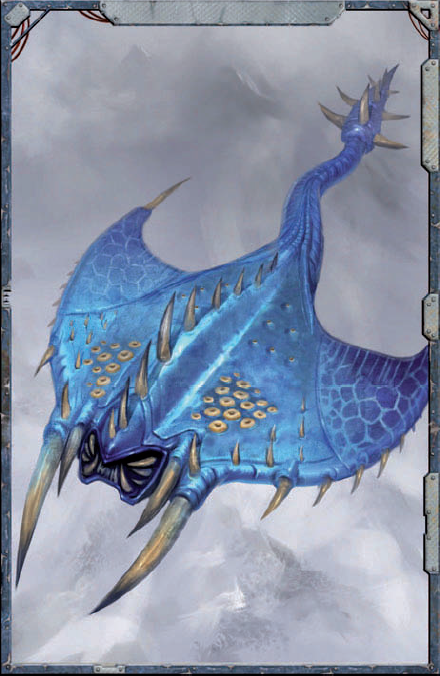 If in some later living world episode you gave the jackal a second endurance spender which would make it and the rider invisible for a moderate amount of time or gave the skimmer the ability to ride the air wakes of raptors leaps, griphon flaps or bunny hops (for a speed or height boost and some endurance refund) then one could maintain the identity of each mount while making their skins more appealing for purchase. I think all mount has the same speed percentage is just that raptor are the best for mobility on land because of it’s distance jump advantage (unless the user has a jackal or a griffon). Omg the charr freezie crown with all the carrots replacing horns. It’s a temporary discount. 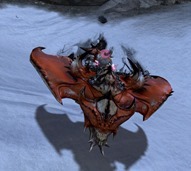 This mount skin will eventually also cost 2k gems. Yup. But it is being offered at a reasonable price initially and i get the feeling that the discounted price may return as often as the item itself. I love that skimmer! Sold! 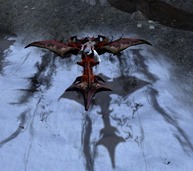 It looks pretty cool, but also a lot “stiffer” in the wings and tail than the standard skimmer mount. The issue I’ve always had with these is that it doesn’t make sense that your head is a snow cone but the rest of your body is fleshy. 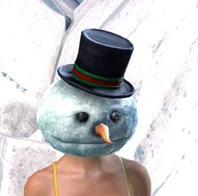 If wearing this helm changed your body to a snowy texture (or you got a normal helm and snowy skin + helm unlock at the same time (like the dual unlocks for the medium armor vampire eyes during Halloween)) then I’d be happy to run around with this silly looking head as a full on snowman. Thats totally true! 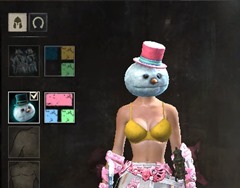 I think you’ll simply need to cleverly piece together your armor set to hide the exposed skin. Is a company doing something right, or wrong, when it releases things so ugly I feel relieved that I have no desire to waste money on them? I believe right. 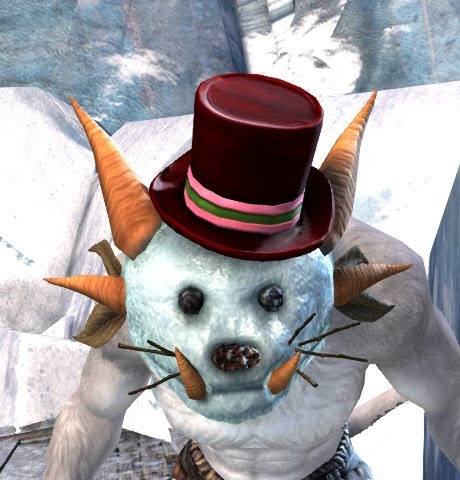 Though when you have something this ugly it really helps if there is an actual lore tie in to justify the fugly-ness. If we had a living world episode where we passed through some demonic realm and got to ride one of these half way through as a plot point (and only got the gem purchase option from a consortium trader afterwards) it would help justify the look by tying it to a set of hardships your character endured. Most people like their characters to sparkle but a fair amount of people don’t mind their characters having ugly scars if there is a story behind them. I wish more things in this game had a lore tie. Lately there has been a large influx of joke items and items that are shiny for the sake of being shiny. For example many of the BL weapon skins… Sometimes its not even about the look, they may look cool but they just simply don’t seem to fit into the world thematically. I wish the weapons were tied to regions, orders, Tyrian races or tribes, or in-game history. Many are, but a good handful are just out of place. Anyway, its not the worst thing ever! But just a thought. 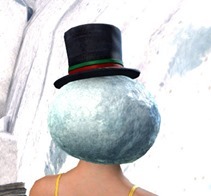 If they were willing to lock black lion purchases behind events (or even just require you to interact with specific black lion or consortium merchants in game to make certain gem purchases) then they’d be able to slot quite a bit of their stuff into the game in a meaningful way. Unfortunately that might give people the impression that they were being forcing into micro-transactions to get decent loot – as opposed to being forced into micro-transactions to get decent loot without realizing it. Dyeing the skimmer helps a great deal. I’ve seen some amazing looks for it. If you color the flames appropriately, it’s looks awesome. As a male Medium armor tier main I can confirm that the fashion designers never had pride or passion in their work. Funny you would say that, because the snowman head is a copypaste from GW1, so I guess thwy must have fired their designers a decade ago, right? Trying to turn personal taste into general fact. Not working. Try again. 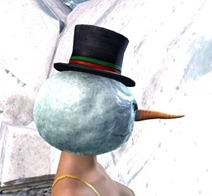 I kinda think the snowman head is a little out of place without the rest of its body LOL Should have made it like a combat skin but race unique and had an army of snowmen doing metas! And I love it for that. 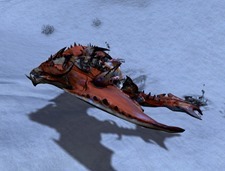 Reminds me what my magus used to ride around on in Warhammer Online. As someone who gets 90% of my computer games through obscene discounts on steam I’ve always wondered if computer games would be cheaper if flash discounts were not legal. With that in mind I’d say selling the premier skins for a once off rotation of 1600 gems (the price which they should have been from the start) before bumping the price up to 2k gems on later rotations is fair and pretty similar to how black lion ticket weapons have always worked in gw2. Though I am left wondering if the next time these premier mount skins are released if they’ll be at their full 2k price or “discounted” to 1600 gems every time they appear. Tengu should be a thing for Cantha if we are ever to see it. Have their own opening personal story start in the Dominion of Winds and the overall encompassing story is all about going back to their ancestral homeland of the Shing Jae Islands. Then have the expansion’s main plot be all about fighting the Empire by creating a revolution. No dragons or what have you, just straight up rebelling against the Emperor. 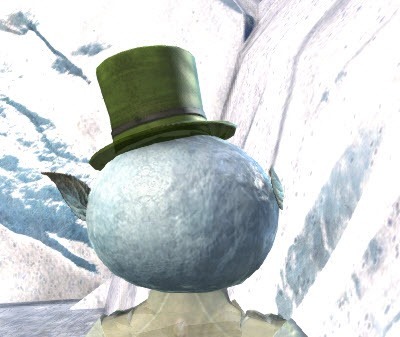 Freeing and establishing the governments of the Luxon and Kurzick people once more. Not necessarily true. I believe it has the potential to be the safest due to its ability allowing it to dodge everything while hovering. That and it is the fastest over water. I mean, sure the Griffon is the best of them all but it all boils down to a preference thing. If you min max your stats and try to get the best, you’d be cycling through the mounts regardless and the skimmer does have its place. I prefer my oceanic skimmer over this skin but thats me and certain dyes does flare up after applying it on mounts (just like dyeing heavy armor vs light armor). Felt this skimmer skin falls way behind its price tag based on my personal judgement on item over value(lack of animation etc for its worth). The water and carrots would make a nice veggie broth! 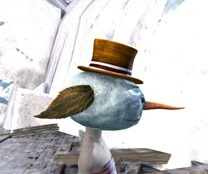 So it seems that ANet started theirs “New Year Sale” again, today is the bank tab for 480 gems [from 600]. Not sure when Dulfy will make a post about it so I’m gonna leave that info here just in case. Price tag is still ridiculous… meh. 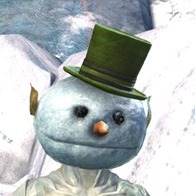 Second day of New Year Sale is Copper-Fed Salvage-o-Matic for 600 gems from 800. The Bank Tab is ending in less than 24 hours. Thanks for posting that. A friend I got to play was short the salvage-o-matic and had 630 gems. He seems to have attained a state of inner piece. 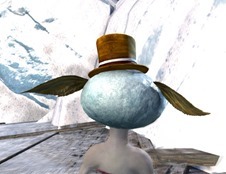 The human/norn is literally just copy/pasted from GW1.